Imperfections like internal staining, chips, or cracks are detriments to your smile’s appeal. As a reliable solution, veneers offer a way to refashion the look of patients’ smiles completely. Our practice offers several enhancement options, from no-prep Lumineers® to traditional all-ceramic. Call Adler Dental and schedule a consultation with Dr. Elaine Adler and Dr. Heather Moed for porcelain veneers in New York, NY. Traditional porcelain veneers are crafted from dental grade materials and provide patients with reliable restorations able to last upwards of fifteen years. Lumineers offer a no-prep or minimal-prep option that is much less invasive than traditional veneers while providing patients with similar flexibility and results. Most patients with minor issues, such as light discoloration or minor chips, can greatly benefit from choosing this procedure. 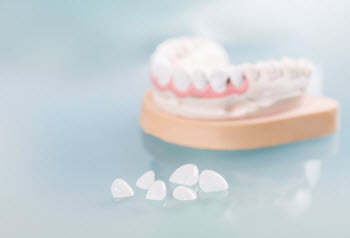 Resin veneers offer patients an economical option that creates an entirely new smile. Resin veneers work adequately to cover issues like cracks and uneven teeth and can be more affordable than Lumineers or porcelain. Before administering veneers, patients’ oral health must be in good-standing to ensure restorations remain as long-lasting as possible. We aid patients in achieving optimal oral health with general preventive and restorative dental care. Patients that receive veneers can expect to maintain dental hygiene, as usual, brushing twice daily and flossing at least once a day. Since porcelain doesn’t decay, patients don’t need to worry about developing cavities on the surfaces of teeth; however, ensuring teeth are free from plaque, and tartar buildup improves longevity and supports a beautiful smile into the future. Additionally, patients with veneers require regular checkups with a dentist to ensure the anchoring set of teeth remain healthy. A smile that is both beautiful and healthy contributes to positive self-confidence and improves their self-image. Call our dental practice and discuss your enhancement options with Dr. Elaine Adler and Dr. Heather Moed. Schedule an appointment for veneers in New York, NY today!